Engage your website visitors in real time with?live chat, and increase your sales conversions. This highly interactive channel lets prospects ask questions or get advice on the products that?best fit their needs.? Assist visitors by proactively chatting with them and sending them targeted messages as they browse your website with Zoho SalesIQ, our?live chat software. ?For those visitors who you think are on the verge of making a buying decision, add them as leads and assign them to a sales rep in Zoho CRM, right from the chat window. Find out whether a visitor is a recurring customer or a?new?prospect before you engage?with?them. Get notified when a hot prospect returns to your website, view their deals in the pipeline, and prioritize your engagements accordingly. If your website receives?1,000 visitors every?day, it's easy to miss out on hot prospects who?browsed your site. 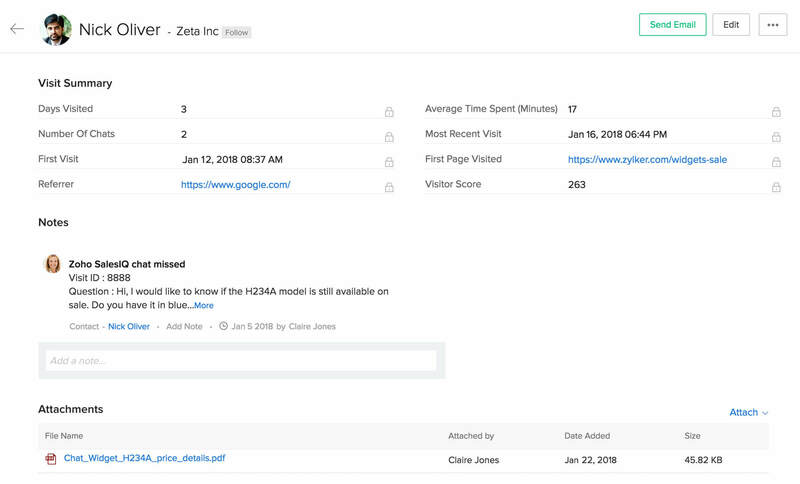 By automatically segmenting visitors into leads, prospects, and customers, Zoho CRM ensures you always stay on top of the people who visited your site. With the entire history of?customer?interactions?and a summary of all their visits at your fingertips,?personalize?all future engagements. Never worry about chat messages that you missed offline,?since they are saved as notes. Customer segmentations are represented in graphs for easy?interpretation. Understand where your visitors come from and what they are looking for, know the day's hot visitors, and more. Compare these metrics over time to identify trends and enhance your customer interactions.